1982 was a pivotal year for the emergence of Maitreya, the Christ and World Teacher, and we celebrate this 30-year anniversary. In 1975 Benjamin Creme began his weekly London lectures, and by the late 1970s was giving talks, by invitation, in Europe. In January 1980 Mr Creme was invited to the USA for the first time and by January 1982 had given over 90 lectures in 28 states, and over 70 radio and television interviews. In January 1982 Share International magazine was launched. It was a truly international, collaborative effort, produced by volunteers in the UK, Holland and the USA. On 3 February 1982 Mr Creme appeared on the famous US Merv Griffin show alongside author Gore Vidal, which reached tens of millions. Afterwards, Tara Center, the US headquarters in Los Angeles, received around 200 new enquiries each day. The advertisements evoked widespread interest, which continued for many years. People still remember, today, the renewed hope these advertisements gave them. 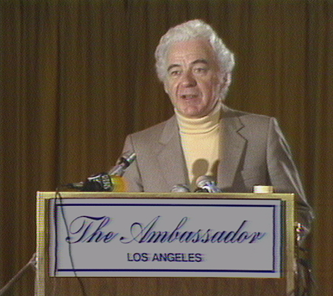 A press conference, therefore, was organised at the Ambassador Hotel, Los Angeles, on 14 May 1982. Over 90 journalists attended, from ABC, CNN, CBS, NBC, BBC, The Times, The New York Times, Newsweek and Time magazine, and other major media. The event was linked via satellite to the UK’s BBC Nationwide programme. Benjamin Creme announced for the first time where Maitreya was living – the Asian community of London, UK. The journalists were open to the information and even applauded about the need for sharing and justice. Mr Creme appealed for a small group of respected journalists to be assigned to go to London to “go through the motions only of looking for Maitreya”. Maitreya would then allow Himself to be discovered. Mr Creme recalls: “When the American media asked the BBC what they were planning to do, they replied: ‘Nothing.’ The Americans said: ‘But why not? It is a fantastic story.’ The BBC’s reply was: ‘We know, but we are waiting for more tangible evidence.’” No journalists were appointed to the task, so Maitreya could not come forward. Although it was seen by the Masters as a “long shot worth taking”, it was hoped that Maitreya would be revealed after the press conference. As we know, the plan did not follow that timescale. Maitreya could not become public without an invitation, otherwise it would infringe our freewill. He therefore embarked on a slower process of emergence, which is now nearing completion. But the events of 1982 were seen by Hierarchy as a tremendous success for the Emergence work: millions were made aware for the first time of Maitreya and His message. The effort and energy expended in this extraordinary year of concentrated, service activity had profound karmic results. In the last 30 years thousands have found their life’s work in preparing the way for Maitreya. Enormous changes have taken place in response to His energies, and millions have been inspired to work for world transformation. Today humanity is awakening, and is ready to work together to build a new world. As is so often the case, Europeans are searching for an ever elusive unity. This time the problem is mainly economic. The Common Market, in this testing economic crisis, is fraying at the seams and losing its precarious unity. The USA, in election year, treads carefully, anxious to see an upturn in trade and a down-turn in responsibility abroad. Israel, therefore is emboldened to take over the task of pressuring Iran. Meanwhile, China is booming and waxing rich while neighbouring Russia apes the USA of the 1930s. Thus the diehards of the old order struggle to keep the leaking ship afloat in the maelstrom of the new and more just energies of Aquarius. The Age of Synthesis is upon us, recognised or not, and every new day etches its stamp on the world. Only the young, and the young in heart, it would seem, recognise the dimensions of this change. They alone know that justice and love can never be cast aside without pain. So it is with the young today who recognise a new note in Earth’s song and seek, by all means open to them, to make it heard. Vast numbers throughout the world are beginning to respond to this new theme and search for valid means to implement their longing for change. Many are beginning to grasp the essentials of life and with courage bear witness to their truth: Sharing, Justice and Love, they comprehend, are the essential ingredients of a civilisation based on the understanding that all men are Gods. In this way the world is slowly being prepared for an entirely new conception of the meaning of life. Tirelessly, Maitreya and His group teach the age old way to happiness and divinity, for these two are one. When men truly understand this simple law they will gladly renounce the patterns of the past: the unholy divide which sustains the greed of so many, the disdain of the rich for the poor and the lust for power and war. They will put behind them this dross which has gripped their imagination for so long. They will listen keenly to the Masters’ advice and will, themselves, change water into wine. A. 60 (as of 12 April 2012). Q. (1) Have any of Maitreya’s interviews in Brazil been broadcast in other countries? (2) Considering the cultural and linguistic ties, have His interviews been broadcast in Portugal? Q. Are any other Latin American countries starting to take an interest in these interviews? A. It is difficult to say at this point. Q. Are there influential people in Brazil (not only in the mainstream but also within the alternative movements, such as the activists who take part in international conferences like the Porto Alegre social forums) who have heard Maitreya being interviewed and who are impressed and inspired by Him? Q. Has Maitreya visited and spoken at any of the Occupy Movement rallies and camps in the US or the UK? Q. In Tahrir Square, Egypt, Maitreya spent three weeks talking to and teaching activists; are any of those people now taking up positions in local or national politics? Q. (1) Is the tension in the world particularly high at present? (2) So many people seem to be exhausted, or suffering some or other heart condition. Is this to do with world tension? A. Yes, the tension is high for people all over the world. (2) Yes. Q. Do the Masters sometimes manifest signs and so-called miracles or inexplicable phenomena in order to give humanity a hint about further realities to be discovered? Q. I find it difficult to ‘empty my mind’ during Transmission Meditation – even when I think I’m aligned I still have all sorts of thoughts churning around in my brain. Is it possible to be aligned and still to be thinking? How do you get rid of thoughts? A. The function of the mind is to think. Don’t worry about the thoughts, keep the attention at the ajna centre, and you will forget the mind and be centred there. Q. Does the tetrahedron help to filter out thoughts and thinking during Transmission Meditation? A. The tetrahedron earths all thoughts below the mental plane, that is astral thoughtforms, etc. Q. Can you elaborate somewhat on what happens with the energies after they have been stepped down through the Transmission Meditation groups? For instance can we think of it as stepping down ‘higher’ thoughtforms in the mindbelt and thus making them more easily accessible for the human kingdom? A. No, nothing like that. The energies leaving the groups go straight to the New Group of World Servers, formed by Maitreya in 1922. (They use that energy without necessarily knowing that it is there.) These people, around 5 million, who in many cases have no conscious awareness of working with energies, employ these energies in their work of service to the world. They are specialists along various lines of service. Q. Do the Masters use the Transmission Meditation energies for work in the animal or the vegetable kingdom? Q. Do the Masters use the Transmission Meditation energies for healing purposes of individuals, groups, or nations? Q. Are the energies also used on the physical and astral plane or only the mental plane? Q. Since the energies are physically palpable during Transmission Meditation does that mean that in a way they are also physical, but on a higher etheric physical level? A. No. They are not physical. They are spiritual, at various levels. Q. Where do the energies enter the etheric body during Transmission Meditation when you are not present? A. Through the chakras as always. Q. Do the energies follow the same path through the chakras in each person during Transmission Meditation? For example, do the energies all enter through the crown centre, then flow to the ajna centre, then to the throat and so on? A. No, it varies with each individual. Q. Where is the ‘reservoir’ of energies that is built up by Transmission Meditation – is it in the mindbelt or is it on one of the etheric planes? A. You could say mainly on the mindbelt. Q. Do the energies flow out of the centres in the palms of the hands and from there into the tetrahedron, during Transmission Meditation? A. From the palms of the hands, and then through the silver wire and into the tetrahedron. Q. My Transmission Meditation group is quite small; usually there are only three of us. If one of us falls asleep during our Transmission is it still useful? A. Yes, to a lesser extent. Q. If the Masters are entering the world from their former hidden-away abodes, not being born of woman and growing up, then why does it say (somewhere, certainly not my invention) in the Alice A. Bailey books that “the Masters will incarnate for the first time since Atlantean days?” Could both be true, thus perhaps suggesting a different number than you said? A. When it says They are incarnating They are stating a chronological fact. The Masters, as a group, are incarnating together for the first time since Atlantean days. This is quite apart from the incarnations of individual Masters over the years. Q. What is a disciple of Shamballa? (1) Does he/she have a Master, like the disciples of the Hierarchy? (2) What makes a person be a disciple of Shamballa? A. (1) Naturally, yes. (2) Their point in evolution. Q. Although there is no particular cause of concern in my daily life in Tokyo, and although we still have quite often rather big or small earthquakes, which I am not particularly worried about, yet I feel unsettled and uneasy. Is it because the etheric field is disturbed and/or deva elementals are out of equilibrium? Q. First of all, thank you people for your work, words hardly express my feelings and thoughts. Mr Creme you rock! I wonder about so many things and I would like to ask a question. Are initiates and disciples always conscious of the fact that they are indeed initiates and disciples? A. Under a certain level, no. Even senior disciples, often engaged in major work in some important public field, can remain unaware of their connection with Hierarchy and do their work better because of it. Q. Apart from revealing the reality of extraterrestrial life to Pope John XXIII, was the nearness in time of the advent of Maitreya explained to him? Q. There is a huge storm on Saturn at present – the size so huge it’s never been seen before – how does this relate to the cyclones in Queensland and America? A. They are all the result of ‘sun-spot’ activity. Q. In the Agni Yoga book Aum, entry 277, it says: “The essence of blood thoroughly permeates the body and even the subtle body. Blood is so undesirable in the diet that only in extreme cases do We permit the use of meat which has been dried in the sun. It is also possible to use those parts of the animal where the blood substance has been thoroughly transmuted. Thus, vegetable food has a significance also for life in the Subtle World.” I understand that you have said that fish are neutral in a spiritual sense, and that therefore it won’t lower one’s spiritual vibration to eat them. Could you explain more about this? For example, why is it alright to eat the blood of fish, but not the blood of land animals? A. Fish have little blood and the flesh of fish is not permeated by it. It is an historical fact that the Essene community, of which Jesus was the head, allowed the eating of fish. The diet of Jesus and his disciples consisted of fish, bread, goat’s cheese, fruit and mild wine. In February 2012, I was working at the Information Centre in Amsterdam. At some point I was standing at the open front door when a tall black man in a postal company uniform walked past, obviously searching for a particular house number. I asked which number he was looking for. He indicated that he’d just found it – the next door building – but he grinned at me and gave me the peace sign as he went on his way. Some time later he came back and started looking at the books on display in the shop window. I said jokingly that I was guessing that he was interested in ‘that book’ – pointing to The Ageless Wisdom Teachings (a book we’ve just decided to use for the next public book discussion evening). “How did you know I wanted that one?” he replied laughing, but added that he also wanted to buy The Awakening of Humanity. He asked questions about who we are, what we do, were we a bit like Buddhists? Did we include the ideas of the ancient Vedas in our information? Do we meditate? I explained about Transmission Meditation. “Yes,” he said, “I meditate too. I’ve been meditating for about 6 years. It’s hard to explain, isn’t it, but it does something to you. It’s important because otherwise it’s hectic.” That last sentence resounded in my conscience-stricken ears and sounded like advice. When he talked about meditation it was serious; I quite frequently feel too hurried and often lack discipline and so I rush off feeling bad about not meditating. He didn’t seem to need answers although he asked questions; he had a confident air and gave the impression of being completely himself in a simple, relaxed, easy way. Was he an unusual postman or was he a Master? Name withheld, Amsterdam, the Netherlands. At the Transmission Meditation workshop in Barcelona, Sunday 4 March 2012, I was standing at the hall entrance, at the side of book tables, before the screening of the video on meditation. Then a person surprised me due to his extraordinary resemblance to Benjamin Creme – a bit younger, in his 70s, similar stature, white hair covered by a cap, similar to the one Mr Creme wears sometimes, jacket and comfortable trousers – and, surprisingly, very fancy sports trainers, white with orange stripes. I looked again to confirm his resemblance, but could not continue with it as ‘Creme’s double’ (if I am allowed to use this expression), turned, walking slowly, taking notes in a small book. He walked and took notes as Mr Creme does with the same gesture of the hand. He was with two women, one around 65, without any showy features, and a younger one, around 30, with soft Asian features. They sat down in a discrete place. I commented on the encounter with three co-workers. One of them went discreetly to confirm he was wearing those fancy sports trainers. 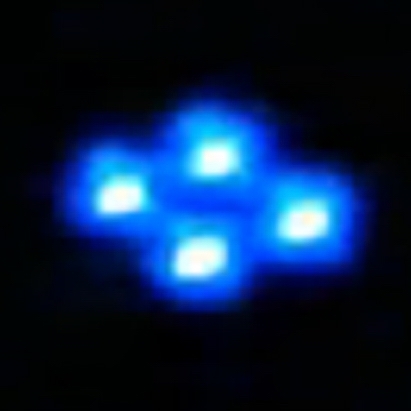 After the video, I verified that the three visitors were still there. They seemed determined to stay during the Transmission. The man removed his cap and you could see that the top of his head was bald. At the end of the meditation, ‘Creme’s double’ was still there, but disappeared quickly from my sight. I didn’t have any special feeling or experience, but I got comfort from the idea that we are not alone, and of course, it was a splendid Transmission Meditation, worthy of remembering. Would you be so kind as to comment who was ‘Creme’s double’ and his companions? After reading this description, I could not help but think of Benjamin Creme’s body of esoteric art as one of the outstanding demonstrations, to date, of this second type of art and beauty. Thank you for your beautiful art. On Sunday 25 March 2012, during the public Transmission Meditation in Paris, I was in the second row of women, facing the row of men while the presentation of meditation was about to start. Suddenly, I looked across to the left of the second row of men when my eyes fell on a man – an Indo-Pakistani, between 25 and 30 years. He had an olive complexion, beautiful black hair, half long and frizzy and black eyes whose white part seemed luminous. At that moment, I had an intuition that it was Maitreya: he had a gaze of such depth. From the beginning of meditation, I felt intense radiations coming from this person when I had my eyes closed. Can you tell me if this man was Maitreya? On 11 June 2011, anti-nuclear power demonstrations and gatherings were held at 140 cities in Japan. I took part in one at Shinjuku. Before the demonstration started, I prayed to Maitreya’s ‘Hand’ for total extinction of nuclear power generation, and put the ‘Hand’ back into my handbag. I marched without any placards. I was physically tired and could not give a big voice. I was a little bit dissatisfied with my small capacity of appeal. After the half way point of the demonstration, a remarkably strong voice was heard from behind: “Protect children!” When I looked back, it was a good-looking young man with a black T-shirt and a black hat. His eyes were very sharp and his sturdy will could be sensed from his face. With a resolute and sincere attitude, he held up a placard which said “Protect children’s lives!” As we walked along the road he repeated, with a loud, clear voice towards onlookers and others on the pavement, “Be concerned! Take action! Protect children’s lives!” I was very impressed and encouraged by him, affirming his words in my heart. After coming back home, and even now, I remember him vividly, who showed me how important it is to be resolute in taking action. He has made my will much stronger than before. Was he a special person? It was a very cold, early morning 36 years ago, when I was asked to drive all by myself to help my family’s business since my husband was ill in bed. I was five or six months pregnant and very nervous because I rarely drove a car. I crossed over a big bridge and tried to turn left. Then it all happened. I lost control of the wheels due to the frozen surface of the road. I cried in my heart, “Help me! Lord Jesus!” Next moment I found myself in the car which had turned over and fallen into a concrete sluice, two to three metres below the road. I was not injured at all. 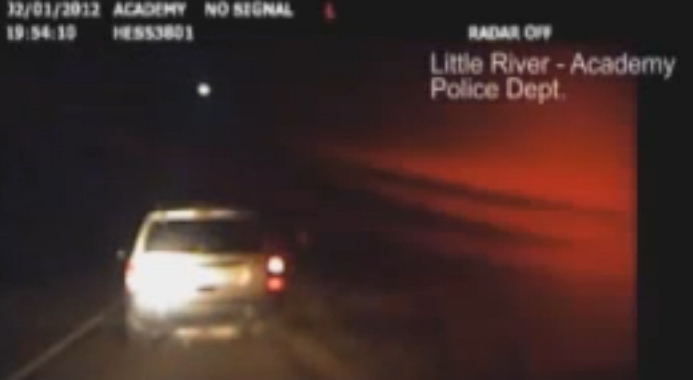 I do not remember well how I got out of the car to walk to a police station. At the police inspection of the scene, I was told that it was miraculous for me to be totally safe without any scratches. The baby in my womb has already grown up to be a parent of a child. I assumed that the Master Jesus helped me because I had been a Christian before my marriage. Would you please confirm it? (1) A demonstration for nuclear power phase-out was held at Shibuya in Tokyo on 24 September 2011. I came by myself and arrived at a meeting point a little bit late. At first I could not find other participants so felt lonely. Then a man emerged with a big placard covered with many explanations of how dangerous nuclear power is. He told me that he would join the demonstration and said, “I am glad to be part of this event today.” On the way to the main event site where many other participants should gather, he earnestly spoke of ‘people power’ in Egypt and Tunisia which had moved nations. He also mentioned another demonstration at Yokosuka the next day where a US carrier stopped at the port with two nuclear power generators inside. I answered, “Yes, I am.” Then later he went towards the front. He was wearing a sweatshirt with short pants, sandals and a small waist bag. He seemed to pay attention to his middle finger of his right hand which a bloodstained band-aid was put on. I remember this vividly since I myself had an injury on my middle finger of my right hand as well. On the way back home, I remembered him and his words, saying that the actions of each one of us counts for the change, which made my eyes fill with tears. Would you confirm that he was a Master? This happened when I was a little bit worried about whether an audience would gather. I wondered whether a Master might come to encourage us. Was he a special person? Hundreds of people are crowding into the church of Sveti Dimitrije (St Dimitrija) in Skopje, the capital of Macedonia, to see icons that began to shine brightly on Sunday 8 April 2012, a week before Easter was celebrated in the Christian Orthodox Church. Hundred year old icons and frescoes which had been covered in candle grease and stains from smoke started to renew their colour by themselves and glittered as if they had been newly restored, said witnesses. It began with some icons and halos on saints’ heads turning gold and spread to all the icons, the haloes, crosses, armour, clothes, and jewellery, and then some colours changed not only to gold but to green or red. The chance of all those frescoes and icons being renewed by an artist or some “chemical”, say observers, are almost impossible since this phenomenon is happening in front of hundreds of people observing the “miracle” with their own eyes. Although the present church was built in the 18th century, it is believed that a church has stood on the site since the 13th century. Nearly two-thirds of Macedonia’s 2.1 million residents are Orthodox Christian and local people consider the phenomenon a sign from God. 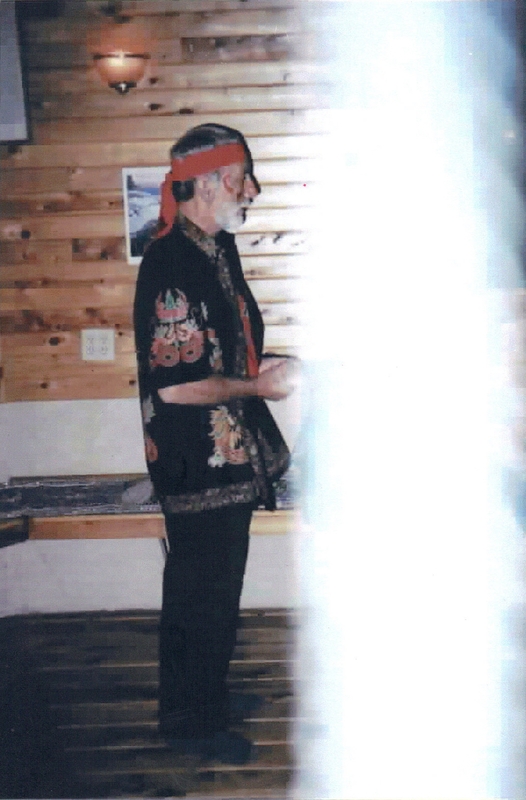 Photograph of a ceremony at Mount Shasta, California, USA, shows a light blessing from Maitreya. Sent by L.S., USA. 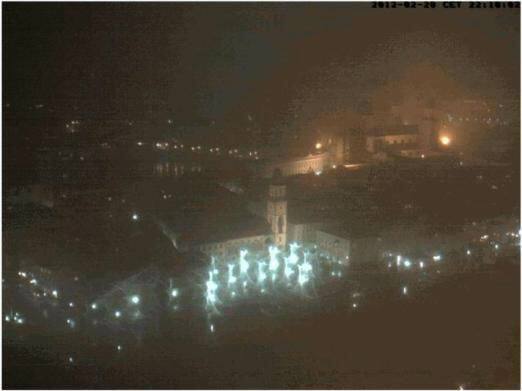 Mysterious ‘ghosts’ in Passau, Germany. 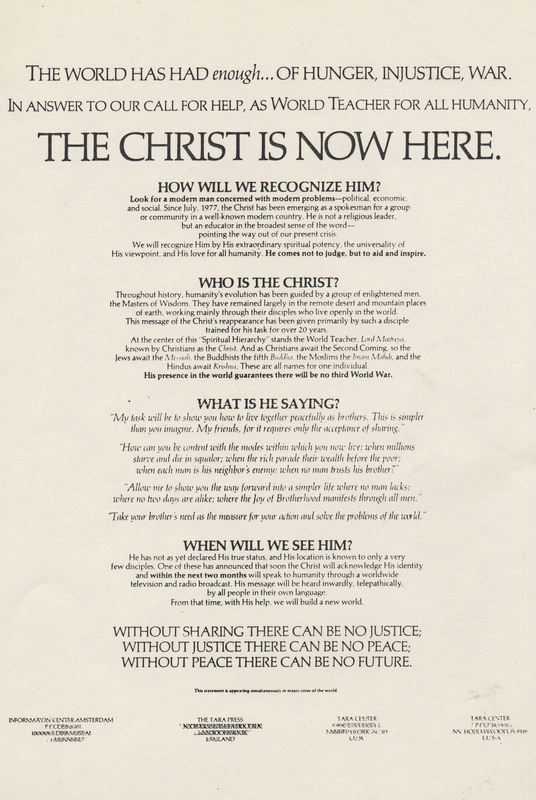 We present a selection of quotations on the theme of ‘World change’ from Maitreya (Messages from Maitreya the Christ), Benjamin Creme’s Master (A Master Speaks), and Benjamin Creme’s writings. History reveals that evolution proceeds but slowly; nevertheless, in this coming epoch, man will outstrip, by far, the pace achieved by his most illustrious ancestors. Profound changes in man’s social life and organisation will release energies hitherto untapped, and unleash upon the world a whirlwind of transformation. Thus will it be. Thus will men meet the measure of their promise and unfold the powers for so long dormant and still. Allow Me to show you the way into the New Time; to outline for you the glories, which, if you will, can be yours. Man is made to serve both God and man, and only through that correct service can the path to God be trodden. Make it your task to take upon yourselves the task of reorientation, reconstruction and change. There is no doubt of the new spiritual awakening which is everywhere taking place, which must eventually lead to an era of world brotherhood – the keynote of the coming age of Aquarius. What is happening now is the outcome of inner forces, which are effecting great changes in human thinking and consciousness. This will result in the complete reorganisation of the world’s institutions and social structures which no longer answer man’s true needs. The world is going to be changed, above all, by the countless millions of people, men and women everywhere, of goodwill. It is precisely the people of goodwill who, in the first place, will respond to Maitreya. He will potentise that goodwill. He will confirm in them their attitude to life and will so potentise it that He will build a world public opinion against which no government on Earth can stand. When men look back to this time they will see it as a stepping-stone to Grace. Today’s chaotic turmoil is nothing less. From this turmoil will emerge the new forms which will grace the new civilisation – new and better forms which will provide for men everywhere, and gratify the hearts of everyone. The new civilisation will be built upon the foundations of the past, but, necessarily, much of the old must be swept away, corrupt and useless as it is. For those with eyes to see, the new indications are already evident. Wherever men turn their eyes today, a new landscape presents itself, new ideas engage the mind, new structures take tentative shape. A world in flux is transforming itself, the growing pains of change are felt by all. There is a complete transformation coming which has to take place at the grassroots level; and it has to satisfy and be real for everyone, otherwise it would not last. The changes have to be logical. They have to be fast but slow enough for people to accommodate to them, so that there will be the minimum disruption, at any given time, of the existing social order. The Occupy and the Indignados movements from across the world are calling for a Global Spring in May 2012, beginning with events to coincide with Labour Day marches. They are calling for the building of a broader coalition with many diverse groups working for economic and social justice and a better world for all. Occupy Finsbury Square is the longest running Occupy camp in the UK, situated in a grass-lined square in the busy City of London. The camp comprises a large food tent, an information tent and many residents’ tents. Banners and flags fly in the breeze capturing the attention of passers-by. Visitors sit down in the information tent and read the literature, chat to the volunteers, and attend the many talks and meetings. In early April 2012 Gill Fry visited the camp for Share International and interviewed Rosa, an undergraduate studying maths and physics at a London university. Since 8 November 2011 she has put her studies on hold, to live and work at the camp. Share International: Why did you get involved in the Occupy Movement? Rosa: I heard about Occupy Wall Street and the struggles they had to have their voices heard. I really admired their determination and commitment to the cause and wanted to find out more about why they were protesting. So on 15 October 2011 I got chatting to people and it inspired my interest. SI: What was connecting all the people at the original Occupy Stock Exchange? What were you hoping to achieve? R: Big businesses were given huge bailouts but had no agreements to pay the money back. It seemed grossly unfair. People began to wake up and realise the impact of the financial system on their day-to-day lives and how unjust and unnecessary it was. This is not capitalism, this is exploitation – there is a difference. More people need to wake up and realise what’s going on. A lot of people are in a state of shock and disbelief that Parliament does not really govern – it is not even the Crown that governs, it’s the City that governs. Most people are still unaware of that and the mainstream media do not report it factually…. SI: So you are trying to educate the public? Your banner reads: “We are the 99%”. Can you explain that? R: The 1% own the majority of the wealth and property in the world, and for the 99%, property ownership is almost inaccessible. We aim to reach out to the 99% and provide information for people to make up their own minds, to inform people of what’s going on, their rights and their responsibilities. The 99% have a responsibility, and the majority realise this, but don’t know quite how to help, whereas the 1% know they have a social responsibility, but just don’t seem to care…. SI: How do you find a consensus in the groups? R. It can be extremely frustrating. My concern with consensus is that it is quite good for majority rule but in terms of protecting the rights of a minority we need to look at the system more thoroughly so we can foster development of minority views more, to create more diversity. I have found that it depends how the question is phrased as to whether or not something reaches consensus. Another issue with consensus is the wave of hands or “jazz hands”. [Hand gestures which denote agreeing/disagreeing with the speaker.] I believe that nobody should be personally targeted for their political view, and everyone is entitled to their opinion. But having the jazz hands, where everyone can see who is for and against, I think is a flaw in our working, and can lead to people being personally criticised for their view, which I think is unfair. I would prefer some tweaking of the system so that people have their privacy protected more. SI: Could you explain about all the different people you have living in this small piece of land? R: We have an amazing range of demographics: different races, ages, religions, levels of education – we’re quite a diverse bunch. We’ve all got our own ideas about how things should be done, but somehow, through the consensus model, we do manage to come to some kind of agreement, which is quite remarkable, really. SI: Do you have meetings every day? R: There’s been some disruption recently because we had a lot of refugees from the [evicted camps of] St Paul’s Cathedral and the Bank of Ideas so we had a sudden influx of population which has been disruptive to our previous structure of having a meeting ever day after dinner. We don’t tend to have a General Assembly every day, which is an important development because previously, at St Paul’s, some people got General Assembly fatigue and important decisions were made in their absence because they couldn’t attend every single day. So by having fewer General Assemblies which are much better attended, the quality of the decision-making is much improved. SI: I saw that your General Assembly today is focusing on ‘Unity’. R: Yes. It is quite important to encourage a polarity of approaches, of views and activities as well. That is something that we have struggled with over the past month or so. Some people believe that their way is the right way, and other people believe that their way is the right way! So it’s about compromise, without being compromised. Somebody said to me: there’s no change without conflict and no conflict without change. We have to have processes of discussion and be able to disagree. SI: How do you manage with resources? Are you getting enough donations? R: We are currently struggling with donations and not receiving enough to sustain the camp, so that’s been quite a challenge. We’ve been feeding over 100 people, three times a day, on £77 a week. We have to go ‘skipping’ [collecting out-of-date food from skips] on a daily basis for what gets chucked out: sandwiches, muffins, salads and quite a lot of sushi! We can’t afford to splash out on anything exotic but we have one cooked meal in the evening, with rice or potatoes and some kind of vegetables, and if we can afford it, we have meat. Our most pressing need in terms of financial requirements is sanitation – it costs a minimum of £90 a week to empty the toilets twice a week. We pay £60 a week for petrol for the generators, so we can have electricity to charge our batteries and have lighting in the kitchen. We also have solar panels and a pedal bike to charge batteries, so we don’t have to rely on 240 volts from the generators. The other expense we have is gas, to heat water, as it is not practical to rely on burning fossil fuels or wood in an inner city environment and around tents which are flammable. Those are our three main expenses, and then we have food to worry about. SI: Are some members of the camp homeless people that you are helping? R: Yes. Because of the eviction of St Paul’s and the Bank of Ideas, those who had places to go went back home, but those who didn’t have any other place of residence came here. How could we turn anyone away? You can’t say: “Go and sleep in a doorway.” A good proportion of people here have no other place of residence. So it is very nice to be able to help people to find shelter and access their primary needs. A lot of the people who are homeless are very functional members of our community who contribute a lot, so it would be really saddening to see them have no other option but to sleep on the streets and not contribute in such a constructive manner to society. SI: How are relations with the local authorities? R: We meet and discuss their complaints and grievances and do everything in our power to try and fulfil their requests. They would rather work with us and progress in a more constructive manner, rather than act in a destructive, authoritarian manner that is going to cause suffering for those who don’t have any source of shelter, or income or hope of getting affordable housing. Islington’s Fairness Commission has certain parallels with some of the core principles of Occupy, so as a council they have much more understanding and compassion for social inequality than other councils. Rosa explained how the borough of Islington, being close to the City, has some of the most expensive properties in London, while at the same time having one of the highest levels of social housing. She explained how many homeless people living without any support are ‘invisible’ to the local authorities. By evicting the Occupy camp, Islington Council would then be responsible for providing housing for the homeless members of the camp, which would increase the already oversubscribed housing list. R: Having a ‘local connection’ is a huge barrier for many people, particularly if they have been on the streets for a number of years, but have not been a registered rough-sleeper or engaged with any services. They may not have friends or family within an area who can give them that local connection. Without education or employment, how can they prove that they have been in an area? They become invisible. But now these people have the opportunity to participate within a community…. SI: You must think it’s important to take the time out of your studies to try to really change society? R: The world’s resources are dwindling, getting less and less, and there might come a time where we have to function without money and with limited resources, work more with exchanges and sharing. So in terms of contingency plans, how do we feed 12 million people in greater London? These are questions we might have to face, sooner than we think. The amount of money spent per head on resources in the camp is very small. Being able to create a system where people can survive and thrive might have national significance in terms of what would we do in a national emergency or a complete financial collapse. SI: Do you think young people are waking up around the world, like in Spain and the Arab Spring? R: There has been increasing marginalisation and victimisation of young people over the past few years. There have become fewer and fewer opportunities than for previous generations. For example, in this country, it’s very difficult to access a degree-level education now, in comparison to how it was 20 years ago. And with the pay gap it is incredibly difficult economically for many people and that has prompted an awakening of what really matters. SI: How is the Occupy Movement internationally? Do you have contact with others in the movement? R: Yes, there is a global roundtable that happens weekly on an internet platform called Mumble where people can get together with Occupy groups from around the world. I believe it is a thriving movement. Emma Swan has a BA in Peace and Conflict Studies, and is currently pursuing an MA in Human Security and Peacebuilding from Langara College in Vancouver, Canada. She has lived for extended periods in countries experiencing difficult economic and political conditions, including Palestine, Sierra Leone and Cambodia. In 2011, she started a library in Palestine. Gary Dorko interviewed her for Share International. Share International: What inspired you to go to Palestine and start a library in one of the refugee camps in the West Bank? Emma Swan: Though I had spent the last year studying the Palestinian conflict as part of my undergraduate studies, I didn’t understand it, and I couldn’t intellectually process what was going on. That’s what initially drew me to work in that area of the world.The library grew as an idea. Initially, I had intended to go to Palestine to teach English at the Karama Centre, which provides free English reading and writing skills to women and children in the Deheishe refugee camp in the West Bank. I was working on a funding proposal and I got into contact with the project co-ordinator, Yasser Al-Haj. When I asked if he had any success stories about women who had gone through the literacy programme so that I could write them into my proposal as tangible evidence of what the Centre was providing, he seemed to shy away from talking about long-term goals and what these women are actually gaining from the programme. That set off alarm bells because anything you learn in school with regard to development is about long-term solutions and not band-aid patch-ups. After many conversations with him, it was clear to me that he felt frustrated as to the next step because a lot of the women leave this programme able to read and write, but become illiterate again within a year. It is not sustainable for them to continue taking classes indefinitely, but after they graduate, they have no access to books, magazines and literature in general, so they have no way to practice their skills. It was clear they needed access to books, so opening a library seemed like such an obvious thing that needed to happen. SI: The library that you started is bilingual – English and Arabic. How did you research what kind of books would be appropriate? ES: The books that we brought in our luggage were English books, and we purchased Arabic books while we were there. We tried to find English books for children that were not culturally inundated with Western values that might be insulting or at least inappropriate to a child living in a refugee camp. Our first thought was to focus on books that dealt with peace or the peace process, but Yasser felt strongly about keeping politics out of Karama Centre, even though we thought it could be positive. He wanted it to be a place to play, to read and write, and not to focus on the conflict that was causing them to be living in a refugee camp. SI: What are the challenges of starting a library in the Occupied Territories? ES: Funding is the biggest issue, plus the very tight controls on getting supplies into the West Bank. There are numerous cases of volunteers who were refused entry and had educational material confiscated. SI: So it isn’t illegal to bring in books, but they have been confiscated by the Israeli Defense Forces at checkpoints? ES: Yes. We had about 420 books in very large roller suitcases completely full, so they just would have had to crack the zipper to see what we had but we managed to get through. We were lucky – others weren’t. SI. You came with English books, and then you made trips into East Jerusalem to buy Arabic books, meaning you had to go through checkpoints several more times bringing books with you. ES: We would do that about once a week. The refugee camp is just outside Bethlehem, about a 30-minute drive from East Jerusalem. The security is always more intense on leaving the West Bank because you are then entering Israel. They search everything and want to know why you are in the West Bank and why you want to come into Israel. We always left the West Bank with nothing, so that was fairly easy. And we always got different soldiers at the checkpoints, so they never got suspicious. When leaving the refugee camp or returning later with books, we would tell them we were coming to Bethlehem to check out the Nativity scene. SI: What has been the response to the library from the children and from the adult community? ES: It was beautiful to see the reaction of the children after they realised that they could actually take these books home. There was an enthusiastic line-up every morning of children who would give you a kiss on the cheek and excitedly tell you the new words they had learned. Sometimes as I walked in the refugee camp, a parent would come up to me and thank me for the library and comment on how their son or daughter was reading books every day. There are a number of teenagers who hang out at the Centre. One of them goes to the University of Bethlehem and another graduated from the literacy programme at the Centre. When I left, they were coming to help run the library four days a week. The next thing we need to do is to hire a full-time librarian. Right now, there are not the funds to do so, but that is my main goal for when I go back: to be in a position to hire someone for at least a one-year contract. Also, I would like to bring in 1,000 books for the library. SI: How would you fit 1,000 books into your suitcase? ES: (Laughter.) No, I would do shuttles into Egypt. I have a friend in Egypt who lives near the border with Gaza. So I would fly into Cairo and buy the books, store them at my friend’s place, and do weekly trips between the West Bank and Egypt bringing in books each trip. SI: What inspired Yasser to open the Centre? ES: He said he was tired of seeing his family being mistreated. He himself was not born in the camp but many of his nieces and nephews were and have not experienced life beyond the camp. He reflects on his experience growing up in Palestine, playing outdoors, climbing olive trees. He sees how these children are growing up in the camp that is overcrowded. There is nowhere to play soccer or kick a ball around, there is no space to play. His first vision for the Centre was to have a plot of land that children could play on and just be kids. From there, he expanded and was able to offer activities, raising funds to buy soccer balls and a badminton set. Then teachers began to volunteer after work and offer reading classes. SI: What kind of opportunities do you see for the children as they learn to read and write? ES: Although they still face huge daily obstacles, by closing the gap in education, they may have better employment opportunities. Also, literacy gives you access to different ways of thinking, broadens your horizons, your world view. As an example, the kids were reading an illustrated book for children on the life of Nelson Mandela. They loved it and asked: “Is this man real?” because they had never heard of him. Another book was called Children in Peace, about young activists. A young girl who was killed in Gaza, Rachel Corey, was in this book and they were able to see how these young people were doing things in the world. They were not rich or famous but they were informed and speaking out against things they did not agree with, so hopefully that offered the camp children some inspiration. Getting an education also fosters critical thinking in the children, which is a help as their situation can be very frustrating. Yasser was alarmed to see the increase in female suicide bombers and he attributed this to the fact that many were not educated. SI: Would literacy also provide the children with opportunities for higher learning? ES: Most definitely. Opportunities are there but they are very limited. There are places put aside for Arab students in Israeli schools, but because of the structural inequalities and the violence that the Arab students experience in their daily lives, they are not able to continue to fill the spaces provided, so the drop-out rate in the Israeli schools is about 50 per cent. ES: Since I have been home in Canada, I have just wanted to talk to people about the situation in Palestine. When you see something resembling apartheid occurring and people are so afraid of the discourse, the language about what is happening, I think this is one reason why the situation has been sustained as long as it has. We need to acknowledge, recognise, address and label – to name what is happening. I think once we do that, it will open dialogues in the international community that will hopefully lead to peaceful solutions. When I use the word apartheid, people shudder. If this is apartheid, then we can’t let it happen: the UN has made that abundantly clear. It is important to get informed and to realise that is what is going on in Palestine. People tend to write the situation off as a religious conflict that has been going on for ever. They think: “I am not Muslim. I am not Jewish. I am not from that part of the world, so I am not allowed to have an opinion about it.” I think that way of thinking is dangerous and enables the conflict to continue. From 23 to 28 March 2012 an international group of people gathered in the unassuming city of Caguas, Puerto Rico, to discuss principles and practices of democratic education. While none of that sounds earth shattering, the organiser, the city and the conference itself represent remarkable stories that combined to give participants in the 20th International Democratic Education Conference (IDEC2012) a profound sense of history in the making, almost like a peek behind the scenes where, according to Benjamin Creme’s Master, many changes have already taken place. 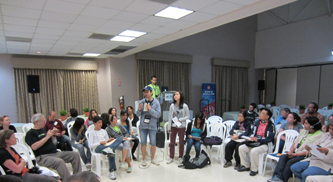 As the organisers designed IDEC2012 in a way to have youth fully integrated into the conference, a substantial contribution was made by members of the Puerto Rican Youth Forum. Natalia Rosado, 18, and Diego Negrón, 15, were responsible for opening the plenary sessions, generating proposals, as well as facilitating workshops and the evening ‘dialogues’, where proposals for future editions of IDEC were discussed and agreed. It was inspiring, not only to see young people so actively involved and engaged in facilitating meetings that were attended by an average of 40 to 60 people, many of whom are stalwarts of the democratic education movement, but to see the process of participatory democracy alive and in action among young and old. Anyone who attended had the right to speak and to vote. Not only the participants, but the organizing parties too made the Conference into a living example of true democracy. One of these was Nuestra Escuela, or ‘Our School’, whose amazing staff and students were responsible for the successful day-to-day running of the conference. Many also participated in plenary sessions or workshops, with a simultaneous translation facility as one of very few hired services. About a year after his daughter Ana Mercedes died in a car accident, Mr Méndez had a dream in which she appeared to him, saying: “Papi, we’re going to make a school.” Justo answered: “My dear, how are we going to make a school?” Ana Mercedes replied: “Yes, daddy, we’re going to make a school, Our School. Just let yourself go.” When he shared his dream with his wife Ana Yris, she noticed a sparkle in Justo’s eyes for the first time since their daughter’s death. The school’s approach is based on human contact and at the start of every semester new students as well as staff are taken for what is called a ‘vital essence’ retreat, meant to find or reconnect with their essential selves and their purpose in life. The educational model is personalised and teaches basic civic, ethics and academic skills and attitudes to improve the physical, psychological and social conditions that enable them to contribute to the construction of a democratic society. Since its inception, Nuestra Escuela has expanded to four schools in Puerto Rico – Caguas, La Barra, Loíza and Vieques – as well as a preschool, Nuestra Escuelita, in the capital San Juan, that serve as sustainable support centres to over 300 young people and their families. Nuestra Escuela has an extremely high retention rate of 98 per cent of students, all of whom graduate and find their way into college, university or the job market. In contrast, the traditional education system in Puerto Rico has a retention rate of 60 per cent, only 30 per cent of whom will have acquired basic skills. The conference concluded with an artistic closing ceremony in front of the city hall with a dazzling mix of song, dance and acrobatics, designed, choreographed and performed by students from Nuestra Escuela and other schools in Caguas, who had been practising every day for a year and drew a standing ovation from the audience. Like many other conference participants, I felt that for four days I had had the privilege of experiencing how the world will be healed and transformed. Youth Forum leaders Diego Negrón and Natalia Rosado (center left) listen as the Korean delegation deliver their pitch during one of the evening ‘dialogues’. Their countries may be dangerously close to confrontation but the citizens of Israel and Iran are extending a hand of peace across cyberspace and across borders. Israeli graphic designer Ronnie Edri recently launched a quirky campaign to build peace with the Iranian public. Posted on Facebook and YouTube the campaign’s logo is “We ♥ you”. The message is clear: “Iranians, we will never bomb your country.” The sites were an instant success with thousands of hits from Israelis and Iranians. In a later YouTube video he appealed for reason and addressed the most charged issue between the Muslim and Jewish governments. “I see sometimes here, on the TV, an Iranian. He is talking about war. I’m sure he does not represent all the people of Iran. Within days the campaign got dozens of messages and comments on Facebook – and even a new Iranian Facebook page in response. The Iranian page says “We love you Israeli people” and features a picture of Abdol Hossein Sardari, an Iranian ambassador to Paris in the 1940s who has been called the ‘Iranian Schindler’ for his efforts to save Iranian Jews in France from the Nazis. Saar Szekely, 27, became a household name in Israel recently, after appearing on the popular television programme ‘Big Brother’. Recruited as a wild-card candidate, his objective was to voice his left-wing views on prime-time television. The Tel Aviv-based artist, against the odds, made it to the final, and became something of a heart-throb. Entering the house in January 2012, after nine weeks of the show Szekely’s conversations started to get more airtime, and then became the focus of the series. “I like the way he expresses himself,” says one viewer, Shelly Malnick, 23, from Haifa. “I don’t agree with everything he says. There are harsh things he has said about soldiers that were really hard to listen to. But he doesn’t stoop to bickering – he has a backbone and he never steps down from a well-mannered discussion. That is why most Israelis love him.” It helps, she says, that he is “very good looking”.